[toc]Fever blisters are caused when the body is infected with a virus known as herpes simplex. This virus is highly contagious and it spreads quite easily upon contact with infected objects or people. 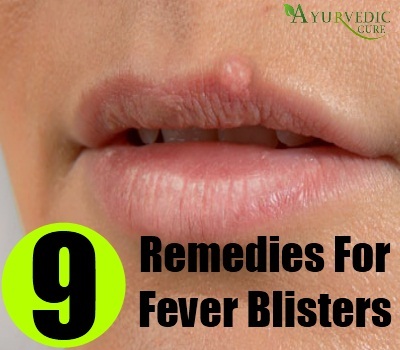 Fever blisters generally form around the lips and they are fluid filled swellings which heal gradually. While it is important to consult a doctor if you contract this condition, you should also consider herbal remedies for treating the problem. Herbs which can be used to treat fever blisters include Burdock Root, Aloe Vera, Licorice, Lemon Balm, Eucalyptus, Tea Tree, White Oak, St. John’s Wort, Chamomile, Peppermint, Red Sage, Black Walnut, Echinacea, Calendula, Comfrey, Red Raspberry and Tea Tree Oil. Fever blisters are painful and it is very easy to use herbal remedies to combat this problem. Lemon Balm or Sweet Melissa is a herb which has antiviral properties. It destroys the herpes simplex virus which causes the fever blisters. 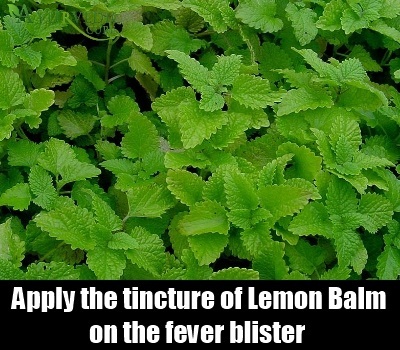 Apply the tincture of this herb on the fever blister to reduce its size and severity. Lemon Balm soothes the skin and heals the blisters. You can also make tea from freeze dried Lemon Balm leaves. You should not use dried Lemon Balm as this is not as effective. Drink the Lemon Balm tea to get rid of fever blisters, especially at the early stage when they are forming. Freeze dried Lemon Balm is more efficacious as drying them at a slow pace causes the herb to lose its curative powers. Licorice root contains specific healing properties with respect to fever blisters. This herb has antiviral as well as anti-inflammatory properties. 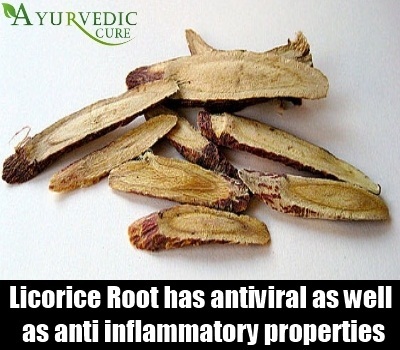 Used as a medical remedy by ancient civilizations in China and Greece, Licorice root is noted for its ability to prevent the replication of virus in the human body. Flavanoids and antioxidants in this herb make it very effective as a cure for fever blisters. People who have high blood pressure, kidney diseases or diabetes should not use this herb. For others, this herb can work wonders if you are suffering from fever blisters. You should mix powdered Licorice root with lukewarm water and use it as a mouthwash till the fever blister in your mouth heals. 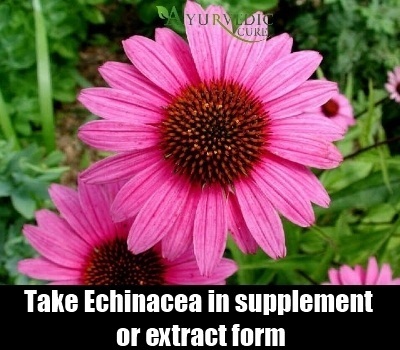 Echinacea is also known by the botanical name Echinacea Augustifolia. This herb is also known as Purple Cone Flower in colloquial terminology. Echinacea is very effective in boosting immune system functioning and it increases the ability of the body to ward off viral infections such as herpes simplex virus. This makes Echinacea a very efficacious herbal cure for fever blisters. The collagen of the skin and mucilaginous membranes is also protected from harm by virus created enzymes through the use of Echinacea. Therefore, this is an excellent herbal remedy for curing fever blisters as well as arresting the eruption of fever blisters at an early stage. You can take this herb in supplement or extract form. Chamomile is also a good herbal remedy for fever blisters. Chamazulene which is a substance found in Chamomile gives it anti-inflammatory properties. This makes it a very effective herbal cure for healing swellings such as fever blisters. 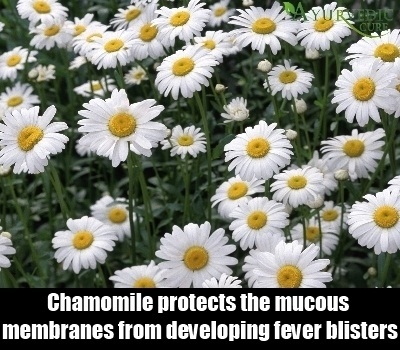 Chamomile also contains another substance known as bisabolol which protects the mucous membranes from developing fever blisters and gives Chamomile antimicrobial properties as well. Chamomile leaves can be soaked in hot water or olive oil overnight and then this liquid solution can be dabbed into the fever blister for complete and lasting relief. This herbal remedy must not be used by persons who have an allergy to Rag Weed. Expectant as well as lactating mothers should also avoid this herbal remedy. You can also apply herbal salves containing St. John’s Wort for healing fever blisters. Melt some beeswax and add olive oil and crushed leaves of this herb to it. Mix thoroughly till the salve is ready. Apply this salve every night on the fever blisters to gain freedom from this problem. St. John’s Wort is an ideal herbal cure for fever blisters because it heals skin lesions well. In fact, this herb was known as a cure for wounds, cuts and blisters in ancient Greece. St. John’s Wort is also known as Hypericum Perforatum. This herb has generally been used in the treatment of depression, but its curative powers make it a good remedy for fever blisters as well. Avoid taking this herb if you are pregnant. Aloe Vera is a truly wondrous herb because it is antiviral, antibacterial, antifungal, antiseptic, anti-inflammatory as well as astringent. These properties make it a great herbal cure for fever blisters. 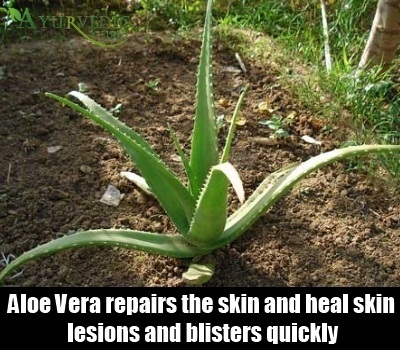 Aloe Vera juice can be extracted from the leaves of this herb and applied regularly to heal fever blisters. Polysaccharides and glycoproteins found in Aloe Vera also help in repairing the skin and healing skin lesions and blisters quickly. Aloe Vera gel can also be taken from the inner mucilaginous leaves of the herb and directly applied on the skin to obtain relief from the fever blisters. Aloe Vera is a safe and non-toxic herb which has tremendous curative powers. It has been used for treating viral diseases as well. Therefore, it also combats the herpes simplex virus which is the underlying cause for the fever blisters. Calendula is a herb which can heal skin ailments well. This herb can also be used to heal fever blisters. Calendula is known by the Latin name Calendula Officinalis. It is commonly called Pot Marigold. There are various skin creams and ointments which contain this herb as well. Calendula leaves and flowers can be soaked in a jar of olive oil for 2 to 3 days and then this oil can be applied on the fever blister. 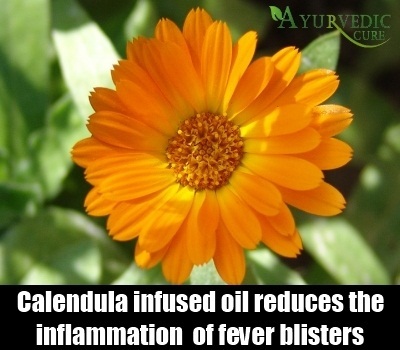 Calendula infused oil reduces the inflammation characteristic of fever blisters. 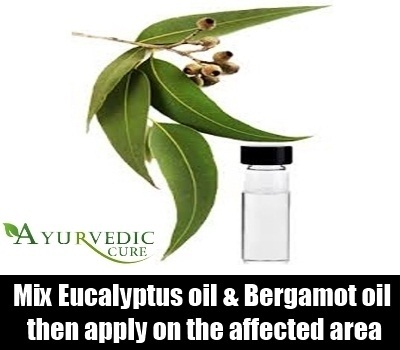 Eucalyptus oil is very helpful in curing viral infections such as herpes simplex. This oil must be diluted before it can be applied on the fever blister. It can be mixed with Bergamot oil and applied on the area where the fever blister has developed. Eucalyptus oil is very useful for curing the blisters because it contains antiseptic properties as well. You should not use this herbal remedy if you are suffering from epilepsy or high blood pressure. Tea Tree oil is another useful herbal remedy for fever blisters. Melaleuca Alternifolia is the botanical name of this herb. This herbal remedy is an antibiotic and it also contains antibacterial and antiviral properties. Thus, it is very helpful in removing fever blisters. 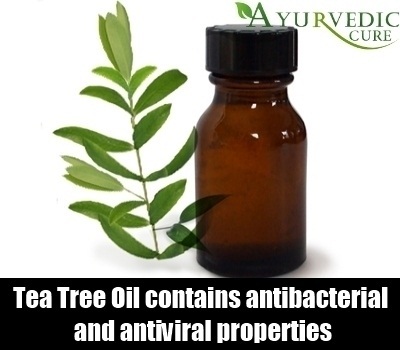 Tea Tree oil can be used for healing cracked skin, wounds, cuts, scratches and sores. You can dilute this oil with Grape Seed oil and apply it on a cotton ball. Gently dab the fever blister with the cotton ball. You need to use this remedy regularly for a few weeks before results begin to show.